‘His words stand alone as poetry’, says Ray Purvis from The West Australian on the first page, and the blurb on the back cover claims ‘Don’t Start Me Talking comprises some of the finest poetry written in Australia’. I both agree and disagree with these statements. The way the lyrics appear on the page gives them the look of poetry, yes. And some of the expression and use of figurative language certainly reads like poetry. I can understand the comparison, and it’s undoubtedly worthy of it. However, is it poetry? I’m not so sure that it is, nor am I convinced that such comments do a songwriter like Kelly justice. They play into the idea that there is a hierarchy of art forms, and that poetry rates higher than pop songs. I wonder if Kelly’s lyrics are being marketed as poetry here, because that might seem to give them more artistic merit or validation in the literary world in which this book will circulate. The fact is, the pieces collected in this volume aren’t poems; they’re songs. And as a genre in their own right, they present a unique reading experience. Songs are written to be sung, to be savoured on the tongue, and to be received by an audience aurally. Of course, it’s interesting to interact with them in a new way. But lyrics, alone on paper, bereft of the melodies that would flesh them out into whole creations, seem to me, at times, a little skeletal. To Her Door was named by the Australasian Performing Right Association in 2001 as being one of the Top 30 Australian Songs, but on the page, I felt it didn’t pack the emotional punch I remembered it having. As soon as I brought it up to watch on YouTube though, I was moved to tears. Likewise, I played Dumb Things, and was overcome with the urge to dance around the room. For me, reuniting the words with the music instantly brought these pieces to life, and my responses to them were so much stronger. A song uses music to communicate at least as much meaning as lyrics. The music is at work behind and around the words to support them, and lift them to greater emotional heights. Like a chemical reaction, these two elements combine to create something with distinct qualities, which transcends the sum of its parts. Without the music to accompany the lyrics, a lot of the repetition, which is such a joy in songs, tends to fall flat, and the strong rhymes and rhythms that make you bop your head and tap your feet to the radio, can come across as a little heavy handed in print. Having said that, many of Kelly’s lyrics still manage to deliver thoroughly satisfying experiences independently, and do indeed become something very close to poetry. Lines like, ‘revenge digs two graves’, and ‘your big heart’s gonna break your little body’ are haunting and powerful. This thick volume, spanning four decades and nearly 400 pages, is a seriously impressive compendium of Kelly’s contribution to Australian music. It would make an excellent addition to the shelf, but it should not, in my opinion, sit there alone. If you want the full, multi-sensory experience, I recommend you get hold of the recordings it references. Perhaps the publishers should even consider packaging the book with a boxed set of CDs to truly demonstrate what kind of legacy this profound and prolific artist has created. After all, what is a song without music? Songs are performances, and to read the lyrics alone is akin to reading a film script without ever seeing the final production. my heroes love, marry, give birth, die and speak. The narratives Kelly’s songs contain are genuine and moving; they express authentic characters in achingly familiar places and situations. What especially excites and inspires me about this book, is its many voices. Kelly writes from varied points of view, and quite often, sings from female characters’ perspectives. This is a rare thing for a male writer or performer. As Emily Maguire has noted in her insightful article Girls on Film, when writing creatively, from a young age, girls tend to craft stories with male leads about half the time, while boys virtually never create female protagonists. Kelly, on the other hand, is a master at the art of empathy. He looks closely and indiscriminately at the tapestry of the world and its complex weave of individuals, and he honours their everyday stories, struggles and triumphs through song. What a phenomenal talent. 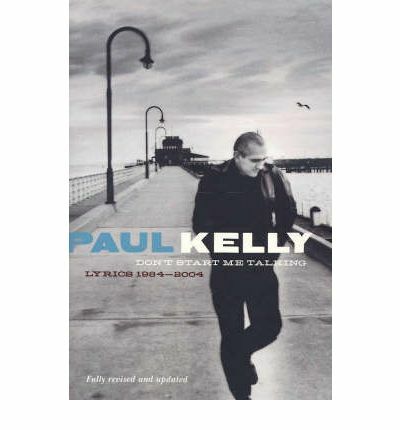 This entry was posted in Arts, Books and tagged book review, books, Don't Start Me Talkin, lip verse, literature, lyrics, paul kelly, poetry, Review, verse. Bookmark the permalink.